The Ovangkol -- also known as Mozambique, Amazoue, Amazique or Shedua wood -- is a small- to medium-size hardwood tree native to tropical West Africa. 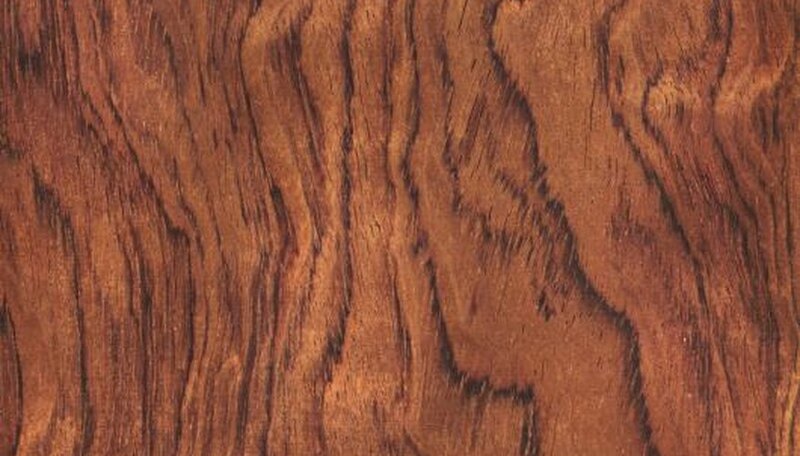 Other exotic wood species in the genus Guibourtia include Bubinga and Tiete rosewood. Where it's common, Ovangkol is used in flooring, cabinetry and furniture. In the United States, the wood is used in flooring, as a veneer and in cabinetry. It is also used in guitars and other stringed acoustic instruments. Ovangkol heartwood displays varied coloration in the yellowish to reddish-brown range, usually with darker stripes of gray, dark brown or black. The sapwood is pale and whitish, grayish or yellowish. The wood has a medium texture and features very small pores. Ovangkol's grain is typically straight but may be slightly interlocking. Attractive curly and rippled grain patterns are common and are often chosen for display pieces. Fresh-cut Ovangkol wood is reported to have a powerful, unpleasant odor although the smell disappears as the wood dries. Like many exotic hardwood species, Ovangkol is very dense, with a weight of 53 pounds per cubic foot. It is considered moderately durable and is resistant to insects. It is, however, relatively soft: the wood's Janka hardness rating of 710 is comparable to that of sycamore and several species of yellow pine. In comparison, Ipe -- Brazilian walnut -- has a hardness rating of 3,684, and white oak has a hardness of 1,380. Although dense, Ovangkol is considered a relatively easy species to work with. It cuts, drills and sands easily. It accepts finishes and glue readily and turns well, except for sections with an interlocking grain. The presence of small amounts of silica, such as mineral quartz, tends to dull blades and cutters faster than other hardwoods. In the United States, some Ovangkol is used for hardwood floors although other, harder woods are more widely used. The species is also used in the manufacture of acoustic guitars, especially for the backs. According to the Taylor Guitar Company, Ovangkol's tone is similar to that of rosewood but has a "sparkle" more often found in less dense hardwoods, such as walnut or mahogany.